Now booking the best deal to Cancun is as easy as 1 - 2 - 3 with Cancun Expo and Mexico expert Pleasant Holidays! 1. Research all of your Cancun Mexico vacation options throughout the various pages of the Cancun Expo web site. 2. Click on the Pleasant Holidays easy to use FREE VACATION QUOTE for a no-obligation air / hotel / car rental price. 3. Pick your vacation dates, airfare and hotel options, book your Cancun vacation directly on-line and start packing!!! "Since 1959, Pleasant Holidays has helped over six million visitors realize their dreams of vacationing in Mexico and in some of the most popular destinations in the world!" Welcome to amazing Cancun, Mexico for November 2010! Take a tip from Carlos Fiesta, Cancun is definately one of the most spectacular destinations on the planet to visit in fall! Great weather, incredibly white sandy beaches, super clear water, and lush green jungles combine to make this tropical destination a very special slice of paradise. No wonder it is one of the most popular vacation destinations on Earth! 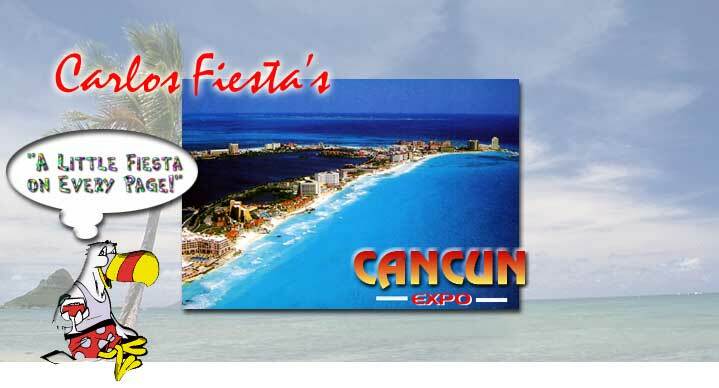 Carlos Fiesta's Cancun Expo web site is the largest source of travel information for Cancun on the Internet. Our 200+ pages and hundreds of links to other web sites provide the Cancun traveler with plenty of helpful information and photographs for this extremely popular Mexico destination. Cancun Expo was designed over many years and many personal trips to Cancun to help you flatten out your vacation learning curve before you arrive in this Yucatan paradise! So pull up a margarita (with or without salt), grab your mouse, and join Carlos Fiesta for a fun adventure into Cancun and Mexico's amazing Yucatan Peninsula!